Dashing RAF pilot Roald Dahl, best-known as the author of Willie Wonka and the Chocolate Factory, wrote his first book on a topic familiar to his fellow pilots: gremlins. These nasty buggers were often held responsible whenever a British plane was damaged or crashed during World War II. Dahl convinced Walt Disney that a film, equal parts live action and animation, about gremlins, who were essentially Nazi saboteurs, would be a great companion to such Disney classics as Snow White, Fantasia, and Pinocchio. Disney bought the rights—in fact, they still own the rights— to Dahl's gremlins, but then ran into a problem bigger than any mythic beast: Dahl himself. 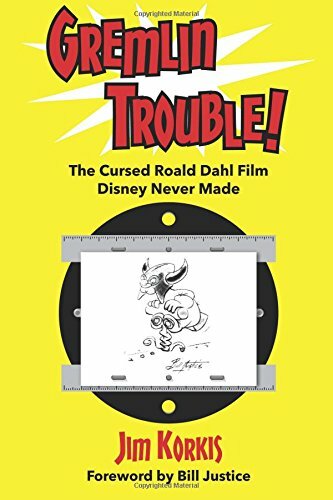 As the Disney studio struggled to make heroes out of the malicious gremlins, and labored to write a script that would appeal to an American audience, a wave of "gremlin mania" swept the country, but Disney had no film to take advantage of it, due in large part to Dahl's lack of cooperation and outright opposition. Americans soon tired of gremlins, and Disney soon tired of Dahl. The incomplete story, art, and animation for the proposed film was chucked deep into the Disney archives, where it remains today. Best-selling author Jim Korkis presents the fascinating tale of Walt Disney and the gremlins, from Dahl's early involvement to a mini-resurgence in recent years, with the publication of a trio of gremlins graphic novels.